Interview with Connie Doebele. · One Book. One Author. One Hour. 1:33 – Doebele was a Producer, Executive Producer, and Executive Director at CSPAN, where she worked with Boknotes since 1994. 4:11 – Authors were chosen for Booknotes through diverse mediums, including producers of the program “trolling” bookstores for interesting content. Brian Lamb was always very active in the selection process because he had to read the books, so he wanted to be interested in the content, and because he insisted in finding new authors to introduce to audiences. 13:03 – Several authors wanted to be on the show but were not invited, despite authors lobbying to be on the program. Lamb was especially interested in having authors of Presidential history, with a special enthusiasm for Lincoln. Authors being approached to be on the program, but turning it down, was rare. However, some authors were put off by the length of the program if they were not familiar with the show. 17: 21 – The simple set for the program was chosen so that viewers would not be distracted by the background, and instead would concentrate on the content. 21:04 – The main preparation for an interview would be Lamb reading the book, taking notes, and preparing questions. As a producer, the main preparation was giving Lamb background information on an author to provide him with possible questions outside of the book itself. 25:25 – Controversy about a book would not keep it from being on the program, but controversy alone would not be sufficient to get the book on the program. 26:24 – Producers did not do much preparation work with authors beyond logistics because Lamb’s questions were so diverse there was not a real way to prepare. 28:54 – There were a few “bloopers” incidents on the show, several of which were technical problems. If there were technical programs and the show had to restart, Lamb would not begin with the same questions. 34:37 – Lamb did this show for so long, he was able to continue to come to the authors and the program with a fresh perspective partly by always choosing new authors and diverse subject matters. The show ultimately ended because of the amount of time and energy needed for the program. Though continuing the program with a different host was considered, it ultimately would have been an entirely different program. 41:00 – Sometimes as a producer Doebele would want Lamb to ask certain questions, but learned not to push because she knew that he would get to them in his own time. Sometimes the content of the questions would be the same ones which were asked at all networks, especially the controversial questions, but they would be asked in a different way and in a different context as a product of CSPAN. 45:58 – If given the choice, producers always wanted to record the program in the CSPAN studios. For authors who were unable to travel and the program had to record elsewhere, developing a simple background and putting together a production crew who could travel were the biggest obstacles to overcome. 50:19 – While producing Booknotes Doebele learned lots about the publishing industry and also sparked her own interest in reading works of non-fiction. 54:00 – Two of the most memorable authors were Vietnam veterans – Timberg and an author whose name she cannot recall – because they bravely talked about their experiences in the war while appearing on TV with their substantial physical scars. 57:43 – The lasting impact of Booknotes has been the ability to look back at people’s opinions about then current events to see how what they said turned out to be accurate or inaccurate. The caliber of the authors and Lamb’s ability to get inside an author’s mind provides a repository of these people which is unique. 1:03:10 – Doebele thought the program was so important because it challenged the idea that Americans did not read and would not watch a long program that is not flashy. Misha Griffith (Oral Historian) , “Interview with Connie Doebele.,” One Book. One Author. One Hour., accessed April 21, 2019, http://booknotes.gmu.edu/items/show/2804. 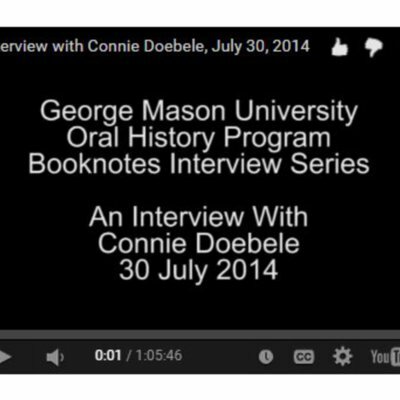 Connie Doebele is interviewed as part of the Booknotes Oral History Project on 30 July 2014. Ms. Doebele a former producer on C-SPAN's Booknotes program discusses the program and its host, Brian Lamb. Booknotes Oral History Series. R0143 Box 01 File 17.